Fresh herbs add a burst of color and flavor as the finishing touch to many of our favorite dishes. But, short of an herb garden or a frequent visit to the farmers market, they are not that easy to keep on hand. So, many ask if they can substitute dried herbs for fresh in the recipes that they are following. The answer is yes, you can swap fresh for dried herbs or dried for fresh herbs… but you should first beware of the rules. Although dried herbs are simply fresh herbs that have been dried, they possess different characteristics in their different states and therefore should be treated differently when being used. 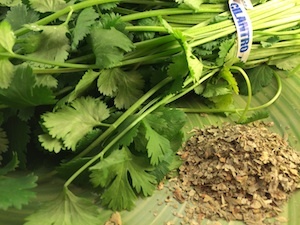 There are other considerations, such as timing, that must be considered when substituting fresh for dried or dried for fresh herbs in a recipe. So, the table below is our short answer, but be sure to read the rules immediately following the table for the complete answer to the fresh vs dried herb dilemma. Dried herbs are about 3 times more potent than fresh herbs. The longer dried herbs sit on your shelf, the less potent they become. Dried herbs are still good for quite some time but their flavor and aroma will dissipate over time. Fresh herbs generally last about a week once picked, whereas dried herbs can last for years. But, the older the dried herbs get the less potent they become. See how long spices last for more information on how to tell the age of herbs and spices. So, if your herbs are older, then you will need to add more than the recommended substitution ratio to achieve the same amount of flavor. Fresh herbs are generally added at the end of a recipes so that they appear vibrant and are not weakened by the sauce. Dried herbs should generally be added at the start of a recipe so that the flavors can be moistened and awakened to flavor the dish. The substitution ratio of fresh to dried herbs is 3:1. So, if your recipe calls for 1 Tablespoon of Fresh Herb then you should add 1 teaspoon of dried herb (keeping in mind the above items). For more information on herbs see our spices page. For more information on basil, see our basil page.